Café-au-lait pigmentation in case of McCune-Albright syndrome. 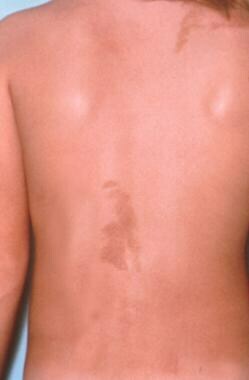 Lesion does not cross midline, which is typical of pigmented lesions in this syndrome. Currently, no clinically proven medical therapies are available for PFD associated with MAS. Oral and intravenous (IV) bisphosphonates (eg, pamidronate, alendronate, zoledronate) may be beneficial to prevent disease progression, although data are conflicting. Important: bisphosphonates are very effective at relieving pain in the majority of cases. No long-term effective medical treatment for ACTH-independent Cushing syndrome is available. The clinical presentation of MAS is highly variable, depending on which of the various potential components of the syndrome predominate (see Presentation). Diagnosis of MAS depends on finding at least 2 of the phenotypic features associated with activating GNAS1 mutations. Early recognition is vital. In typical cases, the diagnosis of MAS is not in doubt. However, in atypical cases, the combination of cutaneous pigmentation, bony lesions, and soft-tissue masses may suggest other conditions (eg, systemic mastocytosis and neurofibromatosis [NF]) (see DDx). Full endocrine studies should be performed under the care of an endocrinologist. Testicular or ovarian hyperfunction is the most common abnormality. Diagnostic imaging modalities that may be considered include plain radiography, ultrasonography, computed tomography (CT), magnetic resonance imaging (MRI), and radionuclide bone scanning (as clinically indicated) (see Workup). Because MAS is a multisystemic condition with a host of variable presentations, management often is challenging and requires a multidisciplinary approach. For most physicians who are not endocrinologists, the crucial points in management are recognition of MAS and referral of the patient to an endocrinologist who is experienced in its management. The endocrinologist, in turn, offers other referrals as indicated (eg, neurosurgeon) (see Treatment). Precocious puberty, the most common endocrine feature of MAS, is a result of gonadotropin-independent autonomous ovarian or testicular function. Precocious puberty caused by this condition is far more common in girls than in boys. In girls, it is the result of estrogen excess from ovarian follicular cysts. Because the sexual precocity associated with MAS is gonadotropin-independent, it is more accurately described as pseudoprecocious puberty. The café-au-lait spots in MAS are large melanotic macules, sometimes referred to as café-au-lait macules (CALMs). Except for hyperpigmentation of the basal layer, no abnormal pathology is seen. Fewer than 10 cases of MAS associated with Cushing syndrome have been well documented. This syndrome is distinct, unlike all other endocrinopathies of MAS, which are slowly progressive and persistent without treatment. Several cases of Cushing syndrome in the context of MAS have regressed within the first few years following onset. Cushing syndrome associated with MAS is predominantly due to adrenocortical hyperfunction. Most of these cases have been described in infants or children. The adrenal glands are bilaterally enlarged and contain multiple small nodules in the cortex. In some cases, Cushing syndrome is transitory. Pituitary-based (ACTH-dependent) Cushing disease in the setting of MAS is far less common. Hyperthyroidism typically occurs later in childhood, though it can occur within the first year of life. Like Cushing syndrome and precocious puberty, hyperthyroidism associated with MAS is a result of 1 or more autonomous hyperfunctioning thyroid nodules. Fibrous dysplasia (FD) in MAS can involve any bone but most commonly affects the long bones, ribs, and skull. It may range from small asymptomatic areas detectable only by bone scan to markedly disfiguring lesions that can result in frequent pathologic fractures and impingement on vital nerves. Approximately 30 cases of FD associated with single or multiple intramuscular or juxtamuscular myxomas (Mazabraud syndrome) have been documented. [2, 3] This syndrome has been associated with precocious puberty and café-au-lait spots and occurs in association with MAS. The myxomas associated with this condition can occur in virtually any location in the muscular system. The exact etiopathogenesis of the syndrome is unclear, because no activating mutations of the GNAS1 gene have been demonstrated in this clinical variant. Simple myxomas typically are benign and solitary, with peak incidence in the sixth and seventh decades. The age of peak incidence for this syndrome is young adulthood, and the tumors commonly are multiple. The main sites of involvement are the large muscles of the thighs, buttocks, and shoulders. They often are located close to FD lesions but typically remain separate from them. They commonly recur, even after attempts at surgical resection. Hypophosphatemic rickets is a potential complication that may worsen the bone disease associated with PFD. It is due to a tubulopathy and characterized by hyperphosphaturia. In patients with MAS, hyperphosphaturia may be due to a phosphatonin similar to that seen in patients with tumor-induced osteomalacia, which appears to be fibroblast growth factor 23 (FGF-23). While MAS patients with hypophosphatemic rickets are typically managed with calcitriol and phosphorus supplements, they must be monitored closely for hypercalcemia, excessive hypercalciuria, nephrocalcinosis, and progressive loss of renal function, as well as the development of secondary hyperparathyroidism. Hepatic abnormalities range from mild elevation of hepatic transaminases to severe neonatal jaundice and chronic cholestasis. Although some liver biopsies appear normal, others reveal mild biliary abnormalities or fatty liver. One case report described fatty liver in an infant with Cushing syndrome, suggesting that the fatty liver may have been secondary to glucocorticoid excess. Elevated transaminases in this infant, however, persisted long after the glucocorticoid excess had been corrected with adrenalectomy. Many case reports describe sudden deaths, mostly occurring in patients with multiple endocrine and nonendocrine manifestations of MAS. Persistent tachycardia has been observed in addition to mild-to-moderate cardiomegaly, even in the absence of hyperthyroidism. Although the cause of death in these patients is unclear, it is presumed to be secondary to cardiac arrhythmia. Females appear to be at greater risk for breast cancer, probably as a consequence of prolonged exposure to elevated estrogen and/or GH levels. The underlying GNAS1 mutation also may play a role. For the same reasons, these patients also appear to be at increased risk for thyroid malignancies and testicular cancer (a novel finding by the National Institutes of Health [NIH]). G proteins couple cell surface receptors to intracellular proteins to activate or inactivate signaling cascades. The stimulatory G protein is normally activated when a hormone or other ligand binds to the cell surface receptor (see the image below). The activated Gs alpha disassociates from the receptor, binds to adenylyl cyclase, and stimulates an increase in intracellular cyclic adenosine monophosphate (cAMP) levels. Gs alpha then is inactivated, reassociates with the receptor, and is again available for hormone-mediated reactivation. 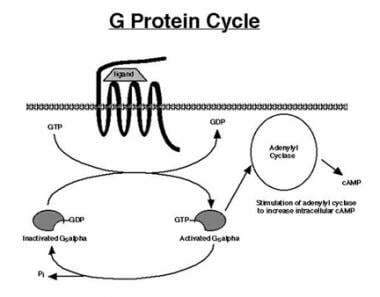 The G protein cycle begins with ligand binding to a 7-transmembrane domain G protein-coupled receptor (GPCR). Binding of the cognate ligand forms a ligand-receptor complex, which then stimulates an exchange of guanosine triphosphate (GTP) for guanosine diphosphate (GDP) on the alpha subunit of the stimulatory G protein (Gs alpha). This activates the alpha subunit, which subsequently stimulates adenylyl cyclase (AC) to increase production of cyclic adenosine monophosphate (cAMP). The alpha subunit contains intrinsic guanosine triphosphatase (GTPase) activity, which cleaves a phosphate group from GTP, converting it to GDP, and thus inactivates the alpha subunit. The inactivated alpha subunit is now ready to be reactivated by ligand-receptor binding, so that the next cycle of signal transduction can occur. The mutations that cause MAS occur at a site in the protein that mediates inactivation of Gs alpha (see the image below). Once activated, the mutated Gs alpha subunit remains activated for a prolonged period despite the absence of hormone (GPCR ligand) stimulation. This results in constitutive activation of Gs alpha, constant stimulation of adenylyl cyclase, and persistently high levels of intracellular cAMP. Increased cAMP levels can mediate mitogenesis and increased cell function. The specific phenotype depends on the cell type containing the mutation. 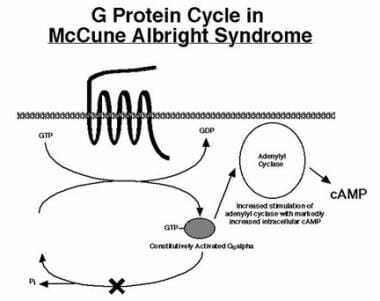 Mutations in McCune-Albright syndrome inactivate intrinsic guanosine triphosphatase (GTPase) activity, thus preventing inactivation of the "turned-on" Gs alpha subunit. Once activated, the mutated Gs alpha subunit is able to continuously stimulate adenylyl cyclase, even in absence of ligand binding to its cognate GPCR receptor. The result is elevation of intracellular cyclic adenosine monophosphate (cAMP) and continual stimulation of downstream cAMP signaling cascades. The classic triad of features in MAS—PFD, autonomous endocrine hyperfunction, and café-au-lait skin pigmentation—can all be explained by activation of the Gs alpha subunit and increased intracellular cAMP levels. Eumelanogenesis (formation of brown/black pigment) is normally stimulated by melanocyte-stimulating hormone (MSH) binding to the MSH receptor, a classic G protein receptor coupled to Gs alpha. Constitutive activation of the Gs alpha subunit in melanocytes results in the increase in brown pigmentation characteristic of the café-au-lait spots seen in the syndrome. Likewise, both the luteinizing hormone (LH) and the follicle-stimulating hormone (FSH) receptors are Gs alpha−coupled receptors. Constitutive activation of the postreceptor cAMP signaling cascade in ovarian follicular cells results in cyst formation, estrogen production, and gonadotropin-independent precocious puberty. Similar mechanisms of increased intracellular cAMP likely explain essentially all of the other endocrine and nonendocrine features of MAS. Because MAS results from a postzygotic somatic mutation, all the daughter cells of the embryonic cell in which the initial mutation occurred also contain the mutation. The earlier the mutation occurs in embryogenesis, the more widespread the tissue involvement. Mutations late in embryogenesis are more focused and account for those mild cases in which only 2 or 3 of the classic phenotypic features of the syndrome are present. If the mutation occurs very late in tissue development after differentiation into a specific cell line, then a single adenoma may result. Gs alpha−activating mutations have been reported in isolated hyperfunctioning thyroid nodules and in somatotroph adenomas. Although GNAS1 mutations could occur in germ cells (either oocytes or spermatocytes), the resulting zygote and all daughter cells then would contain the mutation. Activating GNAS1 mutations are likely lethal if they occur very early in embryogenesis. This accounts for the lack of autosomal dominant transmission of this syndrome. The exact incidence of MAS in the United States and internationally is unknown, but its prevalence is probably between 1 case in 100,000 population and 1 case in 1 million population, rendering it a very rare, sporadically occurring disorder. In a review of radiographs from 82,000 patients, only 23 cases of PFD were found. Polyostotic variants of FD are uncommon, and MAS is even less common. The relative incidence of monostotic FD (MFD) is 70%, whereas that of PFD is 30% and that of MAS is less than 3%. Severe cases of MAS involving multiple endocrine tissues may be recognized shortly after birth. Cases of infantile Cushing syndrome and hyperthyroidism have also been reported in the neonatal period. Additionally, FD, café-au-lait pigmentation, liver disease, and hypophosphatemia can initially be seen in infancy. Less severe findings of MAS can occur at almost any time during childhood. Most commonly, the onset of MAS occurs in early childhood (mean age, 4.9 years; range, 0.3-9 years), typically earlier in girls than in boys. Precocious puberty in girls can be seen in infants as young as 4 months, though it more frequently occurs in girls older than 1 year. Café-au-lait pigmentation is more likely to become apparent later in the progression of the syndrome. GH-producing pituitary tumors and functional-thyroid adenomas secondary to activating GNAS1 mutations can occur in individuals at any age. Disease with a later onset (ie, in the early to late teenage years) tends to be associated with clinically attenuated phenotypes. Both sexes are affected by MAS, but the syndrome has been reported to be about twice as common in females as in males. That girls develop precocious puberty far more frequently than boys (9:1 female-to-male ratio) probably explains why this autosomal mutation is recognized more frequently in girls than in boys. Other manifestations of MAS probably occur with approximately equal frequency in females and males. MAS has no ethnic predilection. Apart from the small subgroup of patients with increased perioperative mortality and those patients who develop malignancies, MAS is not associated with a significantly increased mortality. In general, patients achieve a normal life span. Mortality and morbidity related to MAS result from the fractures, malignancies, endocrine disorders, and other conditions associated with this syndrome. The symptom and disability burden of MAS can be quite high, owing to the associated chronic pain and deformities, as well as the sequelae of chronic multihormonal endocrinopathies. Thus, the prognosis varies according to the manifestations of MAS. With precocious puberty, the prognosis depends on the duration of premature estrogen exposure. Early puberty is not a life-threatening condition and does not seem to lead to problems after true, centrally mediated puberty begins at an appropriate age. Early breast development and vaginal bleeding can be accompanied by loss of adult height potential. Reduction of height potential depends on the degree of bone age advancement that occurs during the periods of early estrogen exposure. FD may have severe effects, including pathologic fractures, facial disfigurement, and vision and hearing problems. It is difficult to treat effectively. Current therapies focus on treating complications of FD, rather than on preventing it from developing. Current studies using bisphosphonates are promising, though it is unclear whether bisphosphonates significantly reduce the morbidity associated with these lesions. Hyperthyroidism can cause severe failure to thrive in infants and young children, decreased attention span, and osteoporosis. Tachycardia resulting from severe hyperthyroidism may complicate or trigger a cardiac event. Radioiodine (131 I) ablation or thyroidectomy treats hyperthyroidism effectively. The long-term prognosis is excellent with adequate thyroid hormone replacement. The long-term prognosis for infantile Cushing syndrome depends on adequate replacement of both mineralocorticoids and glucocorticoids. Individuals remain at risk for significant morbidity or mortality due to adrenal insufficiency during times of severe stress and should receive stress doses of hydrocortisone on an emergency basis. Hypophosphatemia causes rickets and short stature; the pathophysiology of hypophosphatemic rickets, as well as the need for long-term therapy with calcitriol and phosphorus supplementation in these cases, increases the risk of nephrocalcinosis and loss of renal function over time. Gigantism or acromegaly can occur, carrying a risk of glucose intolerance, hypertriglyceridemia, hypertension, and mild myopathy. GH secretion in MAS is difficult to treat effectively. Octreotide acetate or pegvisomant has proved effective in many cases, but not all. Furthermore, radiation treatment of the adenoma increases the risk of malignant change in areas of FD in the radiation field. The long-term prognosis in refractory cases of acromegaly is poor. Although 2 long-term follow-up studies have shown no increased risk of premature death, several authors have noted unexplained sudden death in patients with a severe phenotype. Patients may have multiple endocrine, cardiac, GI, central nervous system (CNS), hematopoietic, and hepatic manifestations, all of which can contribute to significant morbidity. Although no arrhythmias have been detected in individuals with MAS, this is the presumed mechanism of sudden death. Educational requirements depend on the phenotypic expression of MAS. Individuals with FD in critical weight-bearing areas should be instructed to avoid activities (eg, contact sports) that put the skeleton at risk for pathologic fracture. Patients who have undergone bilateral adrenalectomy for Cushing syndrome should be given clear instructions on changing steroid dosing for febrile illnesses. Furthermore, these individuals need to wear medic alert identification bracelets or necklaces so that if severe illness or trauma occurs, medical personnel will be aware of the requirement for stress doses of hydrocortisone. Patients should also be informed MAS is not hereditary and that offspring of affected patients are not at increased risk for the syndrome. For patient education resources, see the Thyroid and Metabolism Center, as well as Thyroid Problems. Ramirez Mejia AR, Moreno Casado MJ, Ahumada Pavez NR, Rojas Soldado MA. Mazabraud's syndrome. New clinical case and review of findings. Reumatol Clin. 2015 Dec 16. [Medline]. Faivre L, Nivelon-Chevallier A, Kottler ML, Robinet C, Khau Van Kien P, Lorcerie B, et al. Mazabraud syndrome in two patients: clinical overlap with McCune-Albright syndrome. Am J Med Genet. 2001 Mar 1. 99(2):132-6. [Medline]. Thomachot B, Daumen-Legre V, Pham T, Acquaviva PC, Lafforgue P. Fibrous dysplasia with intramuscular myxoma (Mazabraud's syndrome). Report of a case and review of the literature. Rev Rhum Engl Ed. 1999 Mar. 66(3):180-3. [Medline]. Corica D, Aversa T, Pepe G, De Luca F, Wasniewska M. Peculiarities of Precocious Puberty in Boys and Girls With McCune-Albright Syndrome. Front Endocrinol (Lausanne). 2018. 9:337. [Medline]. [Full Text]. Messina MF, Aversa T, de Sanctis L, Wasniewska M, Valenzise M, Pajno GB, et al. Adult height following a combined treatment of ketoconazole - cyproterone acetate - leuprolide depot in a boy with atypical McCune-Albright syndrome. Hormones (Athens). 2014 Nov 5. [Medline]. Medina YN, Rapaport R. Evolving diagnosis of McCune-Albright syndrome. atypical presentation and follow up. J Pediatr Endocrinol Metab. 2009 Apr. 22(4):373-7. [Medline]. Dumitrescu CE, Collins MT. McCune-Albright syndrome. Orphanet J Rare Dis. 2008 May 19. 3:12. [Medline]. [Full Text]. Weinstein LS. Bilezikian JP, Raisz LG, Rodan GA, eds. Principles of Bone Biology. San Diego, Calif: Academic Press: Other skeletal diseases resulting from G protein defects--fibrous dysplasia and McCune Albright syndrome. ; 1996. 877-87. Rosen D, Kelch RP. Precocious and delayed puberty. Becker KL, Bilezikian JP, Hung W, et al, eds. Principles and Practice of Endocrinology and Metabolism. 2nd ed. Philadelphia, Pa: JB Lippincott; 1995. 830-42. Bercaw-Pratt JL, Moorjani TP, Santos XM, Karaviti L, Dietrich JE. Diagnosis and management of precocious puberty in atypical presentations of McCune-Albright syndrome: a case series review. J Pediatr Adolesc Gynecol. 2012 Feb. 25(1):e9-e13. [Medline]. Cavanah SF, Dons RF. McCune-Albright syndrome: how many endocrinopathies can one patient have?. South Med J. 1993 Mar. 86(3):364-7. [Medline]. Elhaï M, Meunier M, Kahan A, Cormier C. McCune-Albright syndrome revealed by hyperthyroidism at advanced age. Ann Endocrinol (Paris). 2011 Dec. 72(6):526-9. [Medline]. Zacharin M, Bajpai A, Chow CW, Catto-Smith A, Stratakis C, Wong MW, et al. Gastrointestinal polyps in McCune Albright syndrome. J Med Genet. 2011 Jul. 48(7):458-61. [Medline]. Weinstein LS, Liu J, Sakamoto A, Xie T, Chen M. Minireview: GNAS: normal and abnormal functions. Endocrinology. 2004 Dec. 145(12):5459-64. [Medline]. Kapoor S, Gogia S, Paul R, Banerjee S. Albright's hereditary osteodystrophy. Indian J Pediatr. 2006 Feb. 73(2):153-6. [Medline]. Sotomayor K, Iñiguez G, Ugarte F, Villarroel C, López P, Avila A, et al. Ovarian function in adolescents with McCune-Albright syndrome. J Pediatr Endocrinol Metab. 2011. 24(7-8):525-8. [Medline]. Christoforidis A, Maniadaki I, Stanhope R. McCune-Albright syndrome: growth hormone and prolactin hypersecretion. J Pediatr Endocrinol Metab. 2006 May. 19 Suppl 2:623-5. [Medline]. Yao Y, Liu Y, Wang L, et al. Clinical characteristics and management of growth hormone excess in patients with McCune-Albright syndrome. Eur J Endocrinol. 2017 Mar. 176 (3):295-303. [Medline]. Wood LD, Noe M, Hackeng W, et al. Patients with McCune-Albright syndrome have a broad spectrum of abnormalities in the gastrointestinal tract and pancreas. Virchows Arch. 2017 Apr. 470 (4):391-400. [Medline]. Robinson C, Estrada A, Zaheer A, et al. Clinical and Radiographic Gastrointestinal Abnormalities in McCune-Albright Syndrome. J Clin Endocrinol Metab. 2018 Aug 15. [Medline]. Chapurlat RD, Orcel P. Fibrous dysplasia of bone and McCune-Albright syndrome. Best Pract Res Clin Rheumatol. 2008 Mar. 22(1):55-69. [Medline]. Cohen MM Jr, Howell RE. Etiology of fibrous dysplasia and McCune-Albright syndrome. Int J Oral Maxillofac Surg. 1999 Oct. 28(5):366-71. [Medline]. Diaz A, Danon M, Crawford J. McCune-Albright syndrome and disorders due to activating mutations of GNAS1. J Pediatr Endocrinol Metab. 2007 Aug. 20(8):853-80. [Medline]. Ozono K. [GNAS1 gene abnormality in pseudohypoparathyroidism I a]. Clin Calcium. 2007 Aug. 17(8):1214-9. [Medline]. Wasniewska M, Matarazzo P, Weber G, Russo G, Zampolli M, Salzano G, et al. Clinical presentation of McCune-Albright syndrome in males. J Pediatr Endocrinol Metab. 2006 May. 19 Suppl 2:619-22. [Medline]. Aversa T, Zirilli G, Corica D, De Luca F, Wasniewska M. Phenotypic testicular abnormalities and pubertal development in boys with McCune-Albright syndrome. Ital J Pediatr. 2018 Nov 19. 44 (1):136. [Medline]. [Full Text]. Brown RJ, Kelly MH, Collins MT. Cushing syndrome in the McCune-Albright syndrome. J Clin Endocrinol Metab. 2010 Apr. 95(4):1508-15. [Medline]. [Full Text]. de Sanctis C, Lala R, Matarazzo P, Balsamo A, Bergamaschi R, Cappa M, et al. McCune-Albright syndrome: a longitudinal clinical study of 32 patients. J Pediatr Endocrinol Metab. 1999 Nov-Dec. 12(6):817-26. [Medline]. Demos TC, Lomasney LM, Martin-Carreras T, Sanchez E, Bancroft LW. Polyostotic fibrous dysplasia. Orthopedics. 2014 Nov 1. 37(11):722-82. [Medline]. Arrigo T, Pirazzoli P, De Sanctis L, Leone O, Wasniewska M, Messina MF, et al. McCune-Albright syndrome in a boy may present with a monolateral macroorchidism as an early and isolated clinical manifestation. Horm Res. 2006. 65(3):114-9. [Medline]. Jung AJ, Soskin S, Paris F, Lipsker D. [McCune-Albright syndrome revealed by Blaschko-linear café-au-lait spots on the back]. Ann Dermatol Venereol. 2016 Jan. 143 (1):21-6. [Medline]. Medow JE, Agrawal BM, Resnick DK. Polyostotic fibrous dysplasia of the cervical spine: case report and review of the literature. Spine J. 2007 Nov-Dec. 7(6):712-5. [Medline]. de Araújo PI, Soares VY, Queiroz AL, dos Santos AM, Nascimento LA. Sarcomatous transformation in the McCune-Albright syndrome. Oral Maxillofac Surg. 2012 Jun. 16(2):217-20. [Medline]. Noh JH, Kong DS, Seol HJ, Shin HJ. Endoscopic Decompression for Optic Neuropathy in McCune-Albright Syndrome. J Korean Neurosurg Soc. 2014 Sep. 56(3):281-3. [Medline]. [Full Text]. de Sanctis L, Delmastro L, Russo MC, Matarazzo P, Lala R, de Sanctis C. Genetics of McCune-Albright syndrome. J Pediatr Endocrinol Metab. 2006 May. 19 Suppl 2:577-82. [Medline]. Celi FS, Coppotelli G, Chidakel A, Kelly M, Brillante BA, Shawker T, et al. The role of type 1 and type 2 5'-deiodinase in the pathophysiology of the 3,5,3'-triiodothyronine toxicosis of McCune-Albright syndrome. J Clin Endocrinol Metab. 2008 Jun. 93(6):2383-9. [Medline]. [Full Text]. Lietman SA, Ding C, Levine MA. A highly sensitive polymerase chain reaction method detects activating mutations of the GNAS gene in peripheral blood cells in McCune-Albright syndrome or isolated fibrous dysplasia. J Bone Joint Surg Am. 2005 Nov. 87(11):2489-94. [Medline]. Narumi S, Matsuo K, Ishii T, Tanahashi Y, Hasegawa T. Quantitative and Sensitive Detection of GNAS Mutations Causing McCune-Albright Syndrome with Next Generation Sequencing. PLoS One. 2013. 8(3):e60525. [Medline]. [Full Text]. Randazzo WT, Franco A, Hoossainy S, Lewis KN. Daughter cyst sign. J Radiol Case Rep. 2012 Nov. 6(11):43-7. [Medline]. [Full Text]. Bulakbasi N, Bozlar U, Karademir I, Kocaoglu M, Somuncu I. CT and MRI in the evaluation of craniospinal involvement with polyostotic fibrous dysplasia in McCune-Albright syndrome. Diagn Interv Radiol. 2008 Dec. 14(4):177-81. [Medline]. Esmaili J, Chavoshi M, Noorani MH, Eftekhari M, Assadi M. Late diagnosed polyostotic fibrous dysplasia. Bone scan, radiography and magnetic resonance imaging findings. Hell J Nucl Med. 2010 Jan-Apr. 13(1):65-6. [Medline]. Defilippi C, Chiappetta D, Marzari D, Mussa A, Lala R. Image diagnosis in McCune-Albright syndrome. J Pediatr Endocrinol Metab. 2006 May. 19 Suppl 2:561-70. [Medline]. Dunkel L. Use of aromatase inhibitors to increase final height. Mol Cell Endocrinol. 2006 Jul 25. 254-255:207-16. [Medline]. Mieszczak J, Lowe ES, Plourde P, Eugster EA. The aromatase inhibitor anastrozole is ineffective in the treatment of precocious puberty in girls with McCune-Albright syndrome. J Clin Endocrinol Metab. 2008 Jul. 93(7):2751-4. [Medline]. Wit JM, Hero M, Nunez SB. Aromatase inhibitors in pediatrics. Nat Rev Endocrinol. 2011 Oct 25. 8(3):135-47. [Medline]. Alves C, Silva SF. Partial benefit of anastrozole in the long-term treatment of precocious puberty in McCune-Albright syndrome. J Pediatr Endocrinol Metab. 2012. 25(3-4):323-5. [Medline]. Feuillan P, Calis K, Hill S, Shawker T, Robey PG, Collins MT. Letrozole treatment of precocious puberty in girls with the McCune-Albright syndrome: a pilot study. J Clin Endocrinol Metab. 2007 Jun. 92(6):2100-6. [Medline]. Syed FA, Chalew SA. Ketoconazole treatment of gonadotropin independent precocious puberty in girls with McCune-Albright syndrome: a preliminary report. J Pediatr Endocrinol Metab. 1999 Jan-Feb. 12(1):81-3. [Medline]. Eugster EA, Rubin SD, Reiter EO, Plourde P, Jou HC, Pescovitz OH. Tamoxifen treatment for precocious puberty in McCune-Albright syndrome: a multicenter trial. J Pediatr. 2003 Jul. 143(1):60-6. [Medline]. Messina MF, Arrigo T, Wasniewska M, Lombardo F, Crisafulli G, Salzano G, et al. Combined treatment with ketoconazole and cyproterone acetate in a boy with McCune-Albright syndrome and peripheral precocious puberty. J Endocrinol Invest. 2008 Sep. 31(9):839-40. [Medline]. DiMeglio LA. Bisphosphonate therapy for fibrous dysplasia. Pediatr Endocrinol Rev. 2007 Aug. 4 Suppl 4:440-5. [Medline]. Lala R, Matarazzo P, Andreo M, Marzari D, Bellone J, Corrias A, et al. Bisphosphonate treatment of bone fibrous dysplasia in McCune-Albright syndrome. J Pediatr Endocrinol Metab. 2006 May. 19 Suppl 2:583-93. [Medline]. Mansoori LS, Catel CP, Rothman MS. Bisphosphonate treatment in polyostotic fibrous dysplasia of the cranium: case report and literature review. Endocr Pract. 2010 Sep-Oct. 16(5):851-4. [Medline]. Li GD, Ogose A, Hotta T, Kawashima H, Ariizumi T, Xu Y, et al. Long-term efficacy of oral alendronate therapy in an elderly patient with polyostotic fibrous dysplasia: A case report. Oncol Lett. 2011 Nov. 2(6):1239-1242. [Medline]. [Full Text]. Chan B, Zacharin M. Maternal and infant outcome after pamidronate treatment of polyostotic fibrous dysplasia and osteogenesis imperfecta before conception: a report of four cases. J Clin Endocrinol Metab. 2006 Jun. 91(6):2017-20. [Medline]. Florenzano P, Pan KS, Brown SM, et al. Age-Related Changes and Effects of Bisphosphonates on Bone Turnover and Disease Progression in Fibrous Dysplasia of Bone. J Bone Miner Res. 2019 Jan 15. [Medline]. de Boysson H, Johnson A, Hablani N, Hajlaoui W, Auzary C, Geffray L. Tocilizumab in the treatment of a polyostotic variant of fibrous dysplasia of bone. Rheumatology (Oxford). 2015 Sep. 54 (9):1747-9. [Medline]. Akintoye SO, Chebli C, Booher S, Feuillan P, Kushner H, Leroith D, et al. Characterization of gsp-mediated growth hormone excess in the context of McCune-Albright syndrome. J Clin Endocrinol Metab. 2002 Nov. 87(11):5104-12. [Medline]. Chanson P, Salenave S, Orcel P. McCune-Albright syndrome in adulthood. Pediatr Endocrinol Rev. 2007 Aug. 4 Suppl 4:453-62. [Medline]. Gesmundo R, Guanà R, Valfrè L, De Sanctis L, Matarazzo P, Marzari D, et al. Laparoscopic management of ovarian cysts in peripheral precocious puberty of McCune-Albright syndrome. J Pediatr Endocrinol Metab. 2006 May. 19 Suppl 2:571-5. [Medline]. Majoor BCJ, Leithner A, van de Sande MAJ, Appelman-Dijkstra NM, Hamdy NAT, Dijkstra PDS. Individualized approach to the surgical management of fibrous dysplasia of the proximal femur. Orphanet J Rare Dis. 2018 May 2. 13 (1):72. [Medline]. [Full Text]. Verma RR, Paul A. Fibrous dysplasia of the fourth metacarpal: en-bloc resection and free metatarsal transfer. Orthopedics. 2006 Apr. 29(4):371-2. [Medline]. Boyce AM, Kelly MH, Brillante BA, Kushner H, Wientroub S, Riminucci M, et al. A randomized, double blind, placebo-controlled trial of alendronate treatment for fibrous dysplasia of bone. J Clin Endocrinol Metab. 2014 Nov. 99(11):4133-40. [Medline]. Wu D, Ma J, Bao S, Guan H. Continuous effect with long-term safety in zoledronic acid therapy for polyostotic fibrous dysplasia with severe bone destruction. Rheumatol Int. 2014 Sep 18. [Medline]. Hatano H, Morita T, Ariizumi T, Kawashima H, Ogose A. Malignant transformation of fibrous dysplasia: A case report. Oncol Lett. 2014 Jul. 8(1):384-386. [Medline]. Base of the skull computed tomography scan showing extensive fibrous dysplasia in McCune-Albright syndrome. Note the asymmetrical affectation, with near-total obliteration of various neural foramina at the base of the skull. This degree of fibrous dysplasia can result in multiple cranial nerve compression neuropathies, of which blindness and deafness (from involvement of cranial nerves II and VIII) are among the most disabling. Café au lait spot. This is a fairly large, irregular-edged ("coast-of-Maine" variety) lesion. It presents as a brownish, otherwise-asymptomatic macule/patch. The degree of pigmentation is fairly uniform. Fibrous dysplasia of a long bone characterized by focal bony expansion, patchy areas of sclerosis, and bony cyst formation in McCune-Albright syndrome. Plain skull radiograph in a typical McCune-Albright syndrome case shows marked macrocrania, frontal bossing, and markedly thickened bony table in patchy areas, particularly at base of skull and occiput. Skull also shows hair-on-end appearance, which needs to be differentiated from similar radiologic appearances in Paget disease or poorly controlled hemoglobinopathy (eg, beta-thalassemia, sickle cell disease). Large café-au-lait patches around shoulder in child with McCune-Albright syndrome. Lucency characteristic of polyostotic fibrous dysplasia in patient with McCune-Albright syndrome. Adrenal hyperplasia with nodular elements in adrenal gland isolated from infant with infantile Cushing syndrome in the context of McCune-Albright syndrome. DNA isolated from nodular tissue was determined to have activating Gs alpha mutation (GNAS1), whereas DNA isolated from surrounding tissue did not contain this mutation. Sherry L Franklin is a member of the following medical societies: American Academy of Pediatrics, American Diabetes Association, American Medical Association, Pediatric Endocrine Society, and The Endocrine Society.